Louis Jordan was one of the musical greats who emerged from the swing era to leave a permanent mark on American music. In addition to being an accomplished saxophonist, Jordan is best remembered as a vocalist of immense vitality whose combination of down home earthiness and comical patter played an integral part in the evolution of rock and roll music. Born in Brinkley, Arkansas on July 8, 1908, Jordan’s earliest musical influence can be traced to nearby Memphis, which was a center of activity for bluesmen in the Delta. No doubt, as a youngster, Louis was exposed to the classic blues of songwriter W.C. Handy and classic shouter Memphis Minnie among others. Prior to moving to Philadelphia in 1929 to begin his professional career, Louis studied music with his father and attended the Arkansas Baptist College at Little Rock. Primarily a jazz musician in his formative years, Jordan worked in the bands of Kaiser Marshall, Leroy Smith and Charlie Gaines. In 1936, he joined The Chick Webb Orchestra, playing alto and soprano sax while taking on occasional vocal duties. During his two years with Webb, Jordan was given few opportunities to solo. A notable exception is his soprano sax work on "The Mayor of Alabama", which can be found on Chick Webb, Strictly Jive/1936-1938 (Decca/MCA-Germany). In 1938, Jordan formed The Tympany Five, a "jump" blues band, which emphasized his fast paced vocal delivery and guttural sax style. The name of the band was inspired by drummer Walter Martin, who always used tympani drums during the band’s live shows. While leading The Tympany Five, Jordan would achieve widespread popularity, playing before packed houses and releasing a string of hit records. During this time, Jordan signed with the Decca label and released his first record, "Honey in the Bee Ball." Jordan’s career received a major boost in 1941 when the General Arts Corporation (GAC), an influential talent agency, took over his personal management. His band began to open shows for such artists as The Mills Brothers. During this period, Jordan and The Tympany Five were working at a club called The Fox Head Tavern in Cedar Rapids, Iowa. It was during this extended residency that important elements of Jordan’s musical style were formed. Jordan later stated that the band’s gigs at The Tavern were the turning point of his career. In the following years, Jordan’s live performances with The Tympany Five achieved legendary status as the band began to experiment with novelty routines in their live act. One of the biggest influences on Louis Jordan’s career was Fats Waller. Waller, a popular jazz artist from the 20’s and 30’s, was well known for songs that employed silly wordplay and that displayed a larger than life persona. Such songs as "Ain’t Misbehavin," "Your Feets Too Big," "The Joint is Jumpin," and "I’m Gonna Sit Right Down and Write Myself a Letter" were big hits based on their novelty appeal. In addition to being a prodigious live entertainer, Waller was also a highly skilled musician. Jordan, like Waller, felt that it was important to entertain an audience as well as dazzle them with his musical chops. 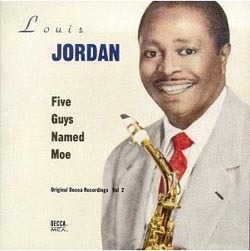 During studio sessions in 1942, Jordan recorded one of his most popular songs, "Five Guys Named Moe"; this is one of the first of his recordings to employ the energetic call and response style that had become a staple of his live shows. Around the time of these sessions, Jordan and the band moved to California. Due to his growing popularity, Jordan also appeared in a number of "Soundies," which were an early form of music video. These short films were formatted to play on specially designed jukeboxes. Jordan’s work in these "Soundies" helped increase the demand for live appearances as well as increase his record sales. Louis Jordan and The Tympany Five were on their way to becoming one of the most important African-American bands of the 20th century. The 1940’s proved to be a pivotal decade in the development of black music. Emerging from the vaudeville era, a variety of artists began to create music that reflected the urbanization of black people in America. The pop harmonies of The Mills Brothers, the be bop jazz of Charlie Parker, the hard rocking rhythm & blues of Wynonie Harris and the smooth cocktail lounge style of the Nat King Cole Trio were just some of the sounds that had begun to redefine black music’s role in popular culture. Jordan’s music, however, drew its power from several different sources. Unlike Wynonie Harris, whose music was rooted in traditional blues song structure, Jordan combined elements of both jazz and rhythm and blues in an effort to create a unique musical style. By the early Forties, Jordan’s musical style had become a unique synthesis of jazz and blues. To attract the attention of the record buying public, Jordan began to feature comedic wordplay and catchy choruses in such songs as "Is You Is or Is You Ain’t My Baby," "Caledonia," "What’s the Use of Gettin Sober (When You’re Gonna Get Drunk Again)," "Choo Choo Ch’Boogie," "Jack You Dead," "Barnyard Boogie" and "Ain’t Nobody Here But Us Chickens". Starting in 1942, Jordan began an 8 year streak, during which he scored 57 R&B chart hits (an incredible achievement), including 18 number one hit records. During this amazing chart run, people began referring to Jordan as "The King of the Jukeboxes." During World War II, Jordan’s activities included releasing V discs (records recorded specifically to raise the morale of the armed forces), appearing on Armed Forces Radio and performing for the troops. The release of such topical songs as "Ration Blues" and "G.I. Jive" increased Jordan’s fan base during the wartime years. By 1948, Jordan began to experience health problems due to his heavy schedule of tour dates. Much of the material that Jordan recorded featured his trademark narrative style of storytelling. A good example of this would be "Saturday Night Fish Fry," a song in which the singer finds himself at a wild party in New Orleans that gets busted up by the cops. The song displays several elements of early rock & roll styles; the distorted sound of an electric guitar, heavy drums and an insistent chorus that declared that the place was "rockin." Recorded in 1950, "Saturday Night Fish Fry" features a talking vocal style that is enhanced by Jordan’s syncopated delivery. Remarkably, when listening to this song, one can hear the earliest roots of present day rap music. When defining Louis Jordan’s role as a pioneer in the development of rock & roll, it’s important to cite his enormous influence over such seminal rockers as Chuck Berry, Jerry Lee Lewis, Little Richard and Bill Haley. Chuck Berry, in particular, gravitated towards using a narrative songwriting style similar to the one developed by Louis Jordan. Instead of recreating Jordan’s roadhouse tales of gambling, drinking and chasing women, Berry transformed Jordan’s subject matter into songs about the everyday concerns of teenagers with material that focused on high school romance and hot rods, thus laying the ground work for rock and roll. As the 1950's began to unfold, and rock itself took hold, tastes in popular music had changed and Jordan began to experience weak record sales. After disbanding The Tympany Five, he formed a Count Basie/Duke Ellington styled big band outfit in 1951. This proved to be a commercial failure as this style of music had become unpopular in post-war America. This period of Jordan’s musical development is captured on Silver Star Series Presents Louis Jordan And His Orchestra (MCA-Coral/Germany). Sadly, this entire project lacked the lively personal touch that characterized Jordan’s earlier records. Much of the music came off sounding as if it lacked coherence. Jordan broke up the big band and retired to his home in Phoenix, Arizona after suffering from continuing ill health while on tour. Jordan soon became restless, however, and decided to return to the music business. In an effort to keep up with the times, Jordan left his long standing record label, Decca records, and signed as a solo artist with the Mercury label in the mid '50's. The resulting album, Louis Jordan: Choo Choo Ch’Boogie (Phillips International) was a solid effort featuring arrangements by Quincy Jones and a backing ensemble consisting of Sam "The Man" Taylor, Budd Johnson and Jimmy Cleveland. The record was largely a reprise of Jordan’s past hits but featured an updated sound that reflected the current sounds of rock & roll. While this record was a commercial disappointment, Jordan’s voice and sax work sparkled with their usual irrepressible quality. Short stints at the Aladdin, Warwick and Tangerine record labels soon followed but most of these releases went unnoticed. In 1962, Jordan toured England with trombonist/bandleader Chris Barber, receiving an excellent reception from fans and critics alike. His work with Barber, which can be heard on Louis Jordan Swings (Black Lion) which was an uninspired mixture of Barber’s traditional jazz leanings and Jordan’s jump blues style. Returning to the United States after the tour, Jordan moved to Los Angeles and put together a revived version of The Tympany Five. His shows continued to receive favorable notices throughout the middle of the 1960’s. In 1967, Jordan toured Asia to great success. He formed his own record label, Pzazz Records, in 1968. His best studio effort for this label was Santa Claus, Santa Claus, which was cut with a big band that was conducted and arranged by Teddy Edwards. On this record, Jordan seemed to resolve his earlier lackluster attempt in the big band genre. During this same period, Jordan released One-Sided Love, which proved to be largely inconsequential. Jordan’s last recording session took place in 1972. Throughout the early 1970’s, Jordan was frequently booked to play the lounge clubs of Las Vegas, Reno and Lake Tahoe where he continued to perform his past hits. One of the more memorable live gigs during this time was a solid performance at the Newport Jazz Festival in 1973. On February 4th, 1975, Jordan suffered a massive coronary at the age of 65 and died instantly. He is buried at the Mt. Olive Cemetery in St. Louis, Missouri. For those of you who want to check out Louis Jordan’s music, I highly recommend Let the Good Times Roll: The Complete Decca Recordings 1938 – 1954; a nine compact disc set released in 1992 by the Bear Family label. In recent years, Louis Jordan’s music has experienced a revival of sorts. Several artists, such as Joe Jackson, have recorded cover versions of his songs. In 1987, Jordan was inducted into the Rock and Roll Hall of Fame in Cleveland, Ohio. The biggest tribute came in 1992 when the musical Five Guys Named Moe, based on Jordan’s music, opened to great acclaim and had a successful run on Broadway. It was also a useful reminder of not just a pioneer in R&B music or precursor to rock and roll and rap but also a great entertainer.